"Do not feed the trolls" and its abbreviation "DNFTT." A Troll is also a toy doll once popular in America. Please don't act like a Troll on patrol (at serious, or Educational websites)! Considered by some to be a "parody of an Encyclopedia:" Under "Different kinds of trolls:"
Troll for a day When a board suffers from group think and stagnation, sometimes one poster will create a new account and log in to tweak the other posters into a flame war. 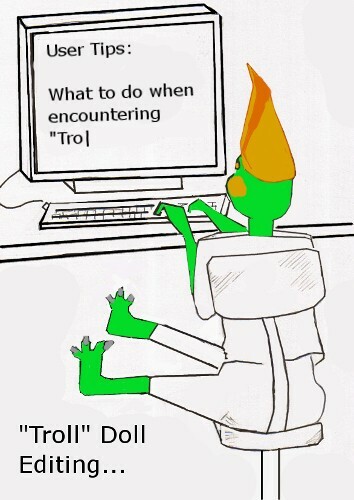 The Troll for a Day will announce they are a TFAD (TFADing) and everyone will congratulate the regular after getting over their murderous impulses for bring the community back to life. Posters on message boards who have experienced this behavior will immediately try to label all newcomers as "TFADs". According to Wikipedia: Person of color (plural: people of color; persons of color) is a term used, primarily in the United States, to describe all people who are not white. The term is meant to be inclusive among non-white groups, emphasizing common experiences of racism. [SIC]  In the United States, this particular term is slightly confusing. For example, many "white Americans" are European descendants, who may have skin pigmentations that range from light brown, to tanish-yellow, to peach, pink and white. Futhermore, many Asian-Americans have skin tones which appear white; they are considered Asian because of facial characteristics, and other identity ties. People in many large human populations express a range of skin pigmentations and skin tones. For Example, Europe has approximately 45 countries;  Europeans express a range of skin colors and tones. There are many dark-brown native people living in Spain, lighter-brown, or tan, people living in Romania, or, as is increasingly true, "black" British people, also known as "black Brits" , living today in the United Kingdom. Is Classifying People Together under "Basic Colors" Similar to Scientific Racism? According to Wikipedia, as a term, "scientific racism" denotes the contemporary and historical scientific theories that employ anthropology (notably physical anthropology), anthropometry, craniometry, and other disciplines, in fabricating anthropologic typologies supporting the classification of human populations into physically discrete human races. Factually speaking, the Human population contains a wide variety of skin coloration; far greater then five basic colors. The term "Person of Color" is used to describe "persons of color," the person can be described using color terminology other than red, yellow, black, brown, or white. What is the Difference between "Genotype" and "Phenotype?" People who study heredity explain that most traits are geneticlly linked, but some are influenced by the environment, or the individual. Genetic Traits: Skin color, Height, natural Hair color. Environmentally Influenced Traits: Skin that is darkened by the sun, called by people, getting "sun-tanned," "sun-browned," or "sun-burnt." Certain Environmentally influenced traits are the results of human activity and, or the environment. For example: People with naturally occuring brown hair may "bleach" or "dye" their hair so that it appears red or blond using hair dyes, or other natural products (such as lemon juice). Older people may use hair dyes to darken their hair in an effort to cover the "gray" hair that sometimes occur during human aging. Another example of a human influenced change in bodily appearance would be chemical hair straighteners. Using chemical "perms," a person with naturally curly hair can make their hair appear (temporarily) straight. Since hair cells (on the head's surface) are dead, using chemicals to create a "chemical change" is not painful (although the chemically changed effect fades as the chemically treated hair falls out, and is replaced by the person's natural hair growth). Scientist who study genetics may use two terms when describing a person's apperance: phenotype or genotype. This was the same girl-friend I grew up with from Kindergarten to graduation. We both had the same second-grade teacher, a “white” teacher, who shared the class with a tall, slender, female African-American Teacher’s Aid. I remember the day we, six and seven year-olds, asked our teacher why brown people were called "black." It was a question a lot of us kids had wondered about. Our "white" teacher said she didn’t know…which is a good answer. If you don’t know, you don’t know. The tall Teacher’s Aid didn’t have a better response, although instinctively, I felt like she knew more than she was telling. I remember our teacher telling the class to stick out our arms and hands, and come together to form a circle. We did, (with our skin touching) and we noticed all the colors we came in…brown, caramel, yellow, tan, pink, and the lightest brown. Although it was fun; I remember the other kids made me aware of being the darkest person there. I was black. In my North Carolina public school, I learned there were eight basic colors…not more. Eight: black, brown, purple, blue, red, orange, yellow, and green. What was/is white (if not a color)? Did "white" people think that white was clear? That the color white was the same as the absence of color? My mind noticed many odd ideas, like strange spellings, and negative numbers…many ideas didn’t make sense to me, but I accepted them (somewhat). To be honest, my mind weaves through a lot of strange ideas…I am thinking of creating a new bumper sticker that many people may want to buy: Education is also UNLEARNING the Mis-education we learn. There are a lot of things that are confusing to a young person, I think there is much confusion today. When I was in college, I remember telling a “white” person (I think of Jewish descent) that black people did not exist. I was trying to be honest and factual. I told her that most "black" people were actually brown or dark brown people. Since we (dark brown people) are dark, I told her that "white" people probably called us "black", "black" people. In my way of understanding, this made sense. I was "black," everyone I grew up around was "black," and all could clearly see that I/we was/were brown. Of course, I met other people who seemed more confused (in college), for example, a friend told me “Oprah Winfrey and Clarence Thomas are white;” this same person, told me his father (who looked to me like an Italian-American) was “black.” Later, he described himself as a brown person (which I agree with. He is brown). Obviously, I think there is a lot of confusion in America. I watched a Christian program that showed black people. People who could not be described as any other color – but black. I noticed what I may have ignored before, black people do exist. Black is beautiful. People of color are beautiful. Now, I live in a pre-dominantly African-American neighborhood, (which is in some ways, like the neighborhood I grew up in). Many people in my neighborhood are black. Sometimes, I am very aware of being brown…not in a fearful way... just aware… I don’t want to be accused of identity-theft [which I’ve never been accused of before…mostly, other brown people have pointed out the lighter-brown regions of my body. Yeah, I notice my multi-hued body...I wonder why they mentioned it?] I think I negated “blackness” when I believed black (people) did not exist, and replaced it with the color brown [And I think I am still confused on how to best express my confusion]. I don’t think that is healthy (for me)…I hope to better describe my reality. I hope people of all colors feel good about their accomplishments, and daily deeds. I am happy using the term African-American. Many people call themselves African-Americans, and identify with a larger group of people who are many colors. At this point, this is who I am, a brown person, who has inherited many features from my black ancestors (and probably, from ancestors of a few other colors); and I am (I think) an America citizen. It’s all good, and Black Is Beautiful! My Fonētekā Key: "Sounds Like"................... "Sounds Like The Letter in the American Alphabet"